The illegitimate child of Elisabeth von Trotta and the painter Alfred Roloff, when the war was over she moved to Düsseldorf with her mother. The absence of her father meant that von Trotta shared a strong bond with her mother, a relationship which, as von Trotta explains, gave her a sensitivity for female friendships and solidarity, a theme that runs through most of her films. (2) After attaining her high school certificate, von Trotta went to Paris, where she discovered the medium of film, and decided she wanted to become a filmmaker. She began her career in cinema as an actress in the films of Rainer Werner Fassbinder and Volker Schlöndorff, and shortly thereafter began co-scripting works with Schlöndorff, whom she married in 1971. She co-scripted (and narrated) Schlöndorff’s The Sudden Wealth of the Poor People of Kombach (1971), turned in a precise, riveting performance in the lead role of Coup de Grace (1974) and co-directed The Lost Honour of Katharina Blum (Die verlorene Ehre der Katharina Blum, 1975). The latter is a story about a young woman who has a casual affair with a man she’s just met – a man she later discovers is a terrorist. Her first solo feature was The Second Awakening of Christa Klages (Das zweite Erwachen der Christa Klages, 1977), a film which confirmed von Trotta’s unique directorial voice by introducing many of the themes that recur in her later work: the complexities of female bonding and the uses and effects of violence. Based on an actual incident involving a Munich kindergarten teacher, Christa Klages features Tina Engel in the title role as a young woman who resorts to bank robbery in order to keep her alternative day care open. Never predictable and full of odd associations and images that distinguish the work of a true filmmaker, Christa Klages was an early indication of von Trotta’s emerging talent. She followed this up with a trilogy of films, which, more than any others, contributed to the development of mainstream feminist cinema. The first, Sisters, or the Balance of Happiness (Schwestern oder die Balance des Glücks, 1979), is perhaps the most personal of all her films. The film is about two sisters emotionally and intellectually joined at the hip. The sisters have a symbiotic relationship that makes it hard for either of them to know full psychological independence – a mutual dependency weighs constantly, heavily on them, even after one, Anna, kills herself. In spite of the weighty and oppressive subject matter, von Trotta makes this drama immensely watchable. The film is starkly, almost maddeningly, German. The atmosphere, like the state of minds of the characters, is sombre. The sisters and their recently widowed mother nearly always wear black, a colour in ready contrast to the well lit sets, and the deft delineation of female cross-identification has drawn favourable comparisons to Bergman’s Persona (1966). 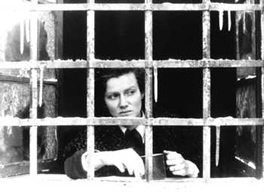 In 1981 von Trotta gained international acclaim with Marianne and Juliane, also known as The German Sisters (Die bleierne Zeit), her calling card to the world and arguably her masterpiece, as well as being the first film directed by a woman to win the Golden Lion at Venice since Leni Riefenstahl’s Olympia (1938). Set in Germany, 1968, Marianna and Juliane, daughters of a priest, fight for changes in society. However their means stand in stark contrast: while Juliane is committed as a reporter, her sister joins a terrorist organisation. After she is caught by the police and put into isolation in jail, Juliane remains as her last connection to the rest of the world. As with most of her films, von Trotta combines emotional dimensions with current political affairs. Like Germany in Autumn (Fassbinder, 1977), Marianne and Juliane mixes the country’s past with its present, implying that the oppressive atmosphere in post-war Germany is responsible for the political activism of the student revolt. The film however, depicts a Germany where terrorism is no longer such an important issue, nor is there a unified collective effort to change things. On the contrary, the film points to an individualistic ending, where Juliane withdraws herself from the collective team-work of the magazine and continues her work on an individual level by explaining to Jan, Marianne’s son, the reasons for his mother’s actions, an exchange between the generations which was denied to Juliane’s own generation. Often a doppelganger motif is at play, with one character, apparently normal and secure, linked with and set against a dark other – an erratic, second-self `sister’ who engages in transgressive or disturbed behaviour and who acts as a mirror for the more stable, integrated female character. Often the spectre of violence, both personal and political, haunts von Trotta’s work; the urban terrorism that rocked West Germany in the 1970s is a favourite theme. Sisterhood – literal or figurative – was once again von Trotta’s subject in Sheer Madness (Heller Wahn, 1982), her powerful follow-up to the much-acclaimed sibling studies of Sisters, or the Balance of Happiness and Marianne and Juliane. Wonderfully acted by the leads, shot partly on location in Provence and Cairo, and featuring the superb cinematography of Fassbinder regular Michael Ballhaus, Sheer Madness is a complex, nuanced, penetrating work that again reveals von Trotta’s facility for coordinating behavioural details into a tremendously resonant experience. Sheer Madness is one of von Trotta’s most sophisticated films, where she uses her considerable analytical intelligence to show exactly how the personal and the political, the public and the private, are inseparable. This theme shone through her next project – the biographical Rosa Luxemburg (1986), an epic political biography of one of the leading figures in the history of European socialism. Barbara Sukowa (who also acted in Marianne and Juliane) shared Best Actress honours at Cannes in 1986 for her passionate portrayal of the eponymous title character. Based primarily on Luxemburg’s letters and speeches, von Trotta’s portrait of this fascinating figure strikes an intriguing balance between the political and the personal, between Luxemburg’s life as a public revolutionary and her private experience as a woman. Having lived and worked in Italy for six years (during which time she produced several Italian films including 1993’s Il Lungo Silenzio), von Trotta returned to Germany to make the first love story which has spanned the years that the city of Berlin was divided. The Promise (Das Versprechen, 1994) is von Trotta’s potent, romantic/political epic that is possibly her best and most commercial venture. The film charts the doomed relationship between Sophie and Konrad, young lovers tragically separated during a botched escape from East to West Berlin shortly after the erection of the Wall in 1961. Employing her acute sensitivity and cinematic rhythm, von Trotta views history and politics through the eyes of the people there. In doing so she provides not only an intriguing historical document but a deeply moving love story. As I touched on previously, von Trotta’s explorations of female psychology have drawn frequent comparisons to the work of Ingmar Bergman, and von Trotta herself has cited Bergman has an important formative influence. (9) It is not by chance that she names Bergman, Hitchcock and the French directors of the ’60s as the most important, lasting influences on her work. Breaking through narrowing limitations, both socially imposed regulations and barriers within a person’s soul; this is the subject matter of stories by this valiant and committed author filmmaker. The private and the political, the shaping of the individual by social connotations, the shaping of roles, in particular those of women, within our modern society are all evidently very central themes in her work. It would be wrong to categorise von Trotta, who was certainly a pioneer in the public process of women’s emancipation during the ’70s, as simply a feminist, a woman filmmaker. She is often regarded more highly abroad than in her home country – a fate she shares with those other German master auteurs Wenders, Herzog, Fassbinder and Schlöndorff. She is particularly acclaimed at pre-eminent film festivals such as Venice and Cannes. In these two countries specifically, Italy and France, upon mention of her name, the response is invariably an admiring “La Trotta”. She is probably the only woman in her profession to enjoy such a lasting reputation, and this is nothing to do with the fact that she is a woman director, but rather because she is a brilliant one. With the acuity of her insights into female relationships, and her facility for drawing evocative performances from performers, Margarethe von Trotta has emerged as one of the first and most enduring female filmmakers working in the narrative idiom, to deservedly take her place with the male likes of Bergman and Mizoguchi as a great director.